If you’ve decided to adopt a rat as a pet, you are probably very open to hearing what rats need to live happy lives. While they may look like guinea pigs and hamsters, their needs are very different. Most of your old hamster equipment will not be suitable for your rat so you’ll need to spend money to give him a comfortable place to live. Know that your rat needs a considerably large cage to live in. 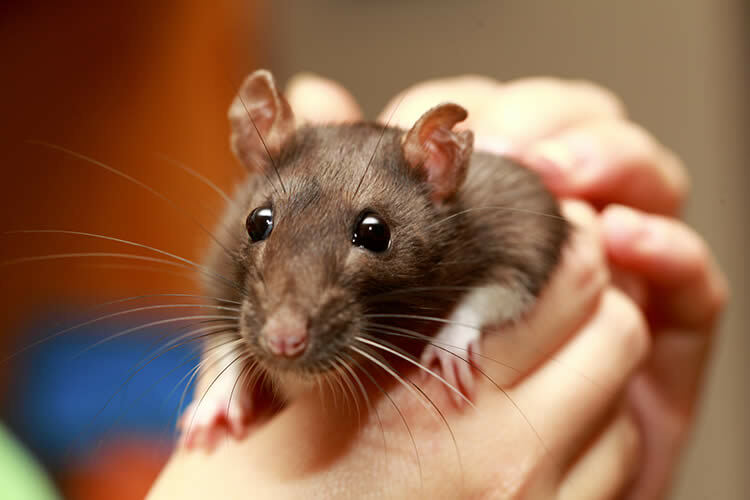 Rats are highly active creatures and they are very intelligent too. Your rat will need plenty of space to run around in and plenty of toys to keep his mind occupied. Rats kept in small spaces with not enough stimulation will become bored and depressed – much like humans. A multi-story wire cage is best. Err on the side of caution – the larger the cage, the better. In terms of scale, a rat should be living in a cage that is akin to a modest-sized human house. Be sure that the wires are close enough together so your rat will not slip out. Any cage entrances should have secure safety latches that cannot be pried or manipulated open. Remember that rats are clever and can easily find ways to escape enclosures. Keep the cage in a well-ventilated area – way from food and away from dining areas. The cage should have a solid, even floor. Delicate rat feet and legs can be injured if a wire floor is not covered in a flat, unbroken surface. Do not use hamster bedding for the floor. Rats need paper shreds, corncob litter, paper towels, or aspen shavings for bedding. Additionally, educate your children on the proper handling of a rat and make sure they do not open the cage without adult supervision. If you have cats or terriers in the house, the rat should be kept in a separate area entirely so that your other pets will not harass him. Your rat should have toys of several varieties. There are games, mazes, and sleeves made just for rats. They are known to enjoy sleeping in hammocks. These little beds are easy to purchase or make. There are exercise balls made for rats, of which you will need one that is at least 11 inches in diameter. The exercise ball is too small if your rat is hunched over in the slightest. Rats will eat pretty much anything so you should strictly monitor what they are given. While it’s tempting to give your rat treats in the form of food, be aware that he will become obese with a high caloric intake. Do not assume that your old mouse and hamster food is suitable for your rat. There are specially made rat pellets you should purchase which will make up the bulk of his diet. Because you want your rat to enjoy life too, human food treats should be given daily – if you dole out the portions sparingly. Fruit, vegetables, cereal, and meat can be given to your rat. Cut the food in tiny pieces and serve them in a small dish placed next to the pellets. Don’t overfeed snacks; a pinky nail-sized piece of apple is to your rat what two or three apples would be to you. It would be best to make sure your rat gets regular medical care but sometimes vet costs can be an insurmountable obstacle. If you follow the basic care guidelines, you will maximize the chances that your rat lives as long a life as possible. Know that if you rescue a rat, his time with you may not be more than a year. A normal rat lifespan is about one to two years, and you can make that short time his golden years with a few simples purchases. When Can I Touch a Newborn Puppy?